Dialog is arranged in pairs. On the first tug of the rope gives just a little and Dunfor utters his first line. 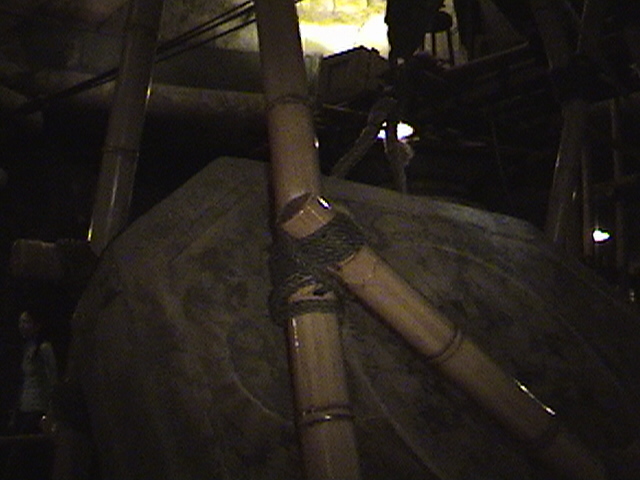 Then a second tug is enabled for his final exclamation, when the rope goes slack. After the rope tightens again the sequence is repeated with the next pair. "Careful while I translate this… Let's see, um, 'twenty years of,' ah, 'sorrow to the,' ah, 'destroyer of this vessel!' "
"Leave off the rope old chap, be a good fellow. I have a frightfully valuable artifact down here. Oh no [crash.] I HAD a terribly valuable artifact down here. "I say leave off the rope old chap, be a jolly good sport. "I say quit mucking about up there. Oh blast! Not again [fall, crash]. "Blast it all, you don't want to pull the rope. Please remember that each time you pull the rope, attached to poor Dunfor's harness, near the sign "Please don't pull the rope," you give a Pullit surprise. If you are still having trouble seeing Three Dimensionally, click here for a quick flix of your brain switch. With "Cross-eye Freeviewing" you can enjoy the rest of the site, no 3D glasses required. It's like View-Master — without having to share. <8=o)-BACK— to Journal. Updated on 2012.11.03.